When we think about dealing with allergies, we rarely think about commercial air conditioning. This is understandable as most of our days are spent not at work, but at home. However, it’s worth bearing in mind that illness and allergy symptoms can seriously affect productivity. Indoor air quality can really make a difference to the working lives of people suffering from allergies, asthma or other respiratory conditions. Let’s take a closer look at some of the options available for dealing with these problems. This is a great place to start; a poor quality air conditioner will not be as good at controlling the flows of particulate into the property. The first step to controlling allergies is to get control over the air flow and ensure that an appropriate filter is fitted. Another consideration is the size of the system and its suitability for the property. When a system is a wrong size, it’s less likely to be pulling in the right amount of air, and your building will not get enough filtration. Installing a filter with a high Minimum Efficiency Reporting Value (MERV) rating will get you on the path to cleaner air. Most of the air conditioners available are already dehumidifiers to a certain extent, but they are not as effective or efficient as a dedicated unit. This could be a portable unit in a smaller location, or larger system may be installed. When there is less moisture in the air, mould spores are less likely, and mildew is less likely to develop the property. This is an excellent solution for properties that are located in a humid climate. UV light has been used for quite a few years now for cleaning air and water supplies. The light sterilises the air by killing off bacteria and viruses, removing their ability to reproduce. The neutralised germs are safer to breathe in, and they will not trigger allergic reactions. This system is widely used in germ sensitive locations, such as research facilities and hospitals. An air filtration system is a separate system used in addition to the air conditioning filter. It has a larger surface area, and it can catch more particulate, removing it from the air flow. Another option is to install an electronic air cleaner that uses ionization to charge particles. The charged particles then cling on to surfaces with an opposite charge and remove them. If they’re thinking about commercial air conditioning, Perth based property owners and managers should contact us. Gas & Air, supplies, installs and services heating and cooling equipment for the domestic and commercial sectors. 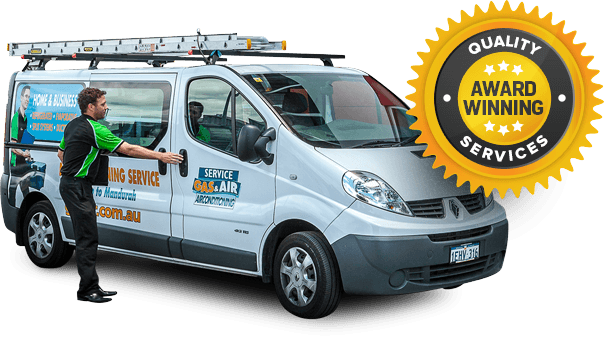 Our highly trained specialists can carry out a commercial air conditioning repair to get your system working again. Our sales team is standing by to discuss your needs in greater detail and to answer any remaining questions you may have.